I have a strong believe that if children are taught a second language while they are young, they will do better in other aspects of life. 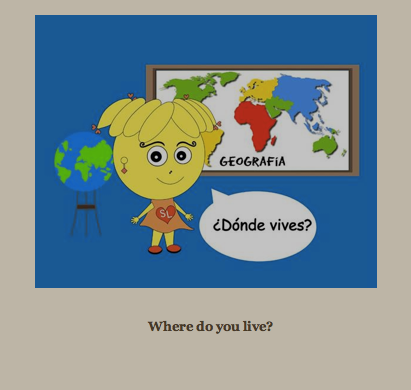 That’s why when I saw that Happy Language Kids wanted a review of their book Maps/Mapas, I was very happy to help them out. Happy Language Kids was written by author Suzy Liebermann as a learning tool to help children learn another language and a little bit about about the culture. And Ms. Liebermann really did do a wonderful job making learning fun. That way if you or your child doesn’t know Spanish, then your child can hear the words pronounced, and your child can repeat the words back. There is also a replay button that allows you to replay the word or phrase over and over until you get it right. I love this book because it could be a learning tool for children who speak English to learn Spanish, or Spanish speaking children to learn English. 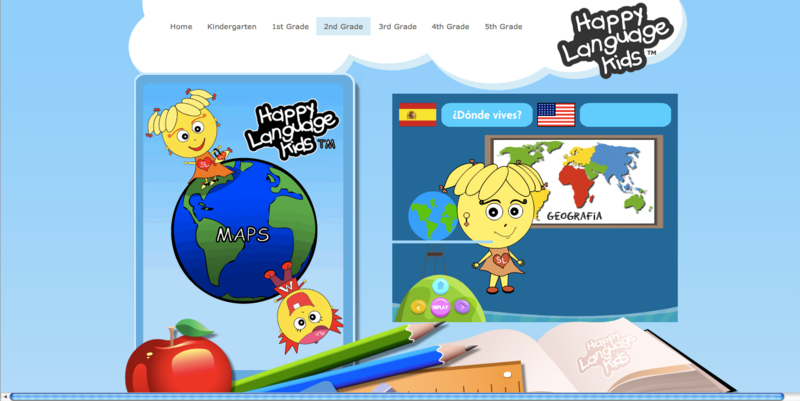 Happy Language Kids has more books available for grades from Kindergarten to 5th grade, and would make a great addition to your home learning routine. Purex® recently sent me some of their Purex UltraPacks plus Oxi. The Purex UltraPacks plus Oxi are actually pretty neat. Here is what they look like. Inside a Purex UltraPacks plus Oxi pack is enough concentrated laundry detergent for a full load of normal clothes. There is no measuring or pouring, you just throw that little Purex UltraPacks plus Oxi pack in the washer with your clothes, the outside of the Purex UltraPacks plus Oxi dissolves, and the detergent comes out in the water. It’s really that simple. Here is what I like about them. Great if you are traveling. I do have one con. You only get 26 in a bag, and when you are using 1-2 Purex UltraPacks plus Oxi packs per load at $6.99 (on Amazon), the price is quite a bit more than the bottle of laundry detergent per load. 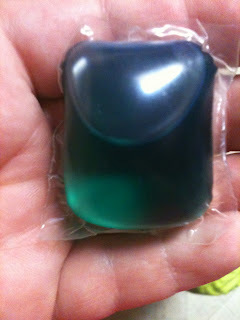 Now, if you are like me and usually look for the cheapest way to do household chores, then you will probably want to stick with your normal detergent (I love the Purex® liquid). But, if you are in a hurry, then this would probably be a wonderful product for you. 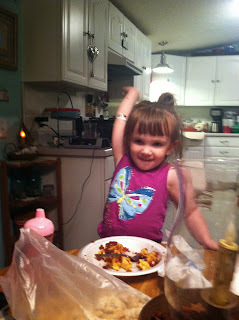 If you are like my sister, and suffer from multiple food allergies, than this post is for you. A few months ago, I decided to go on a “mission” to find a company that caters towards those with food allergies and the food actually tastes good. 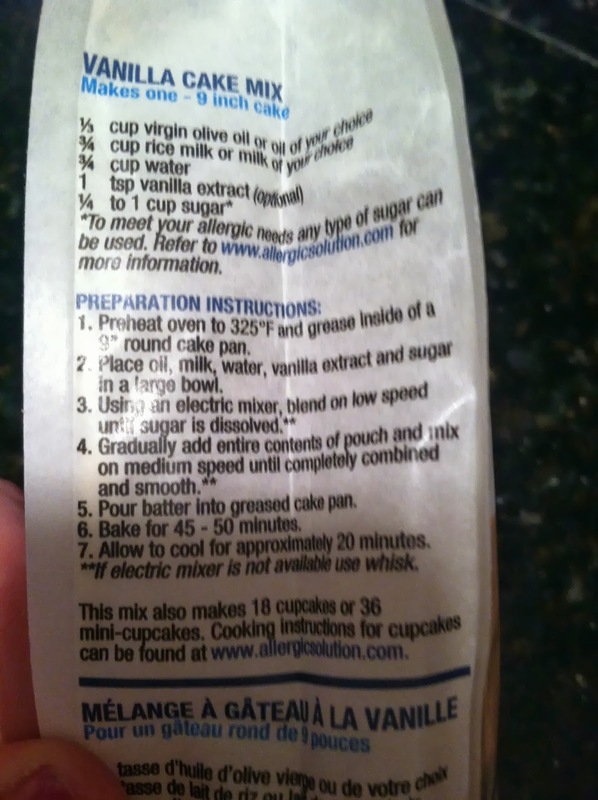 In my search I found a company called Allergic Solution. 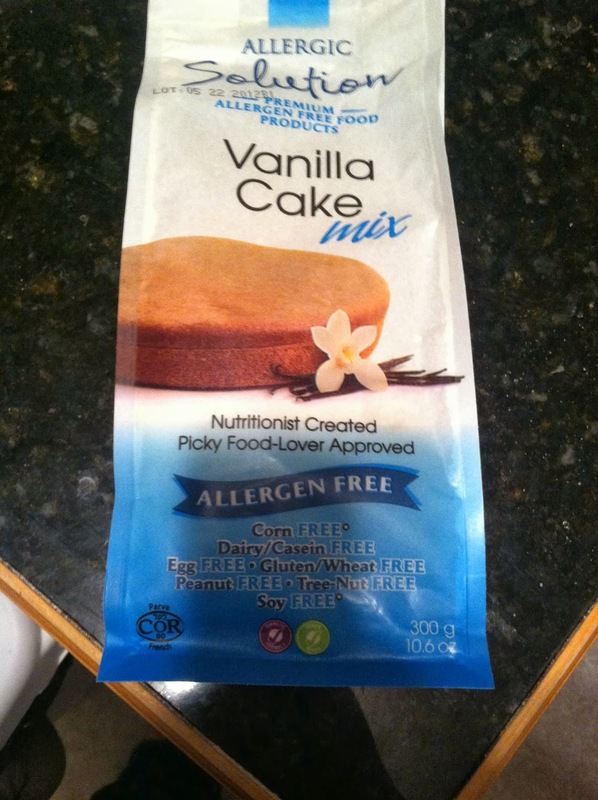 They make different mixes that corn free, dairy free, wheat/gluten free, peanut free, tree nut free, and soy free. Their mixes are also diabetic friendly, all vegan, and kosher. Allergic solution sent me a pack of their mixes. They currently have four mixes; Vanilla Cake Mix, Carob Cake Mix, Pancake & Waffle Mix, and Yeast-free Bread Mix. 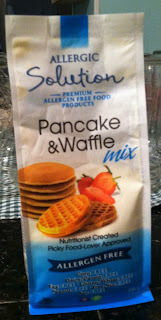 So far, my sister, Sarah, and I have tried the Vanilla Cake mix and the Pancake & Waffle mix. The recipe was super simple. With this one did call for eggs, but I am sure that their is a way to leave those those out. We did use Soy milk in these too. 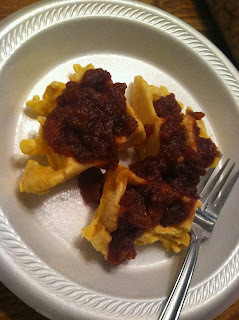 To cook them, we use a little spray oil, and just poured the batter on the waffle iron. The waffles were nice and fluffy. We decided to dress them up with some apple butter. They were actually very good, and Goose approved of the waffles by eating most of her’s. These were very good waffles. They don’t taste like normal waffles, but had a wonderful flavor. I do believe I would make them again. Next, we made the vanilla cake. Now, the vanilla cake did not have any egg, just soy milk, the mix, sugar, oil, and vanilla extract. 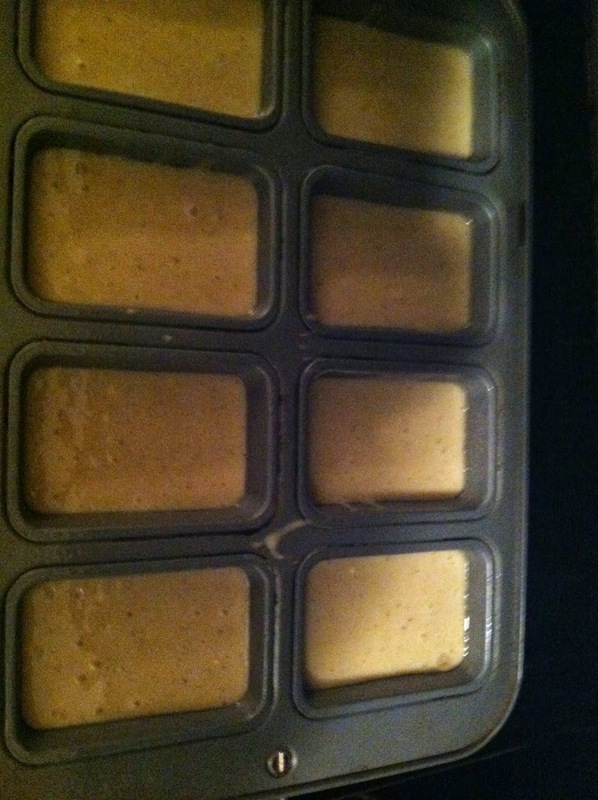 The batter mixed up nice a smooth. 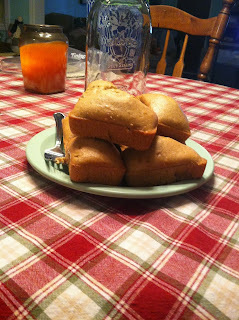 We decided to make 8 mini cakes instead of a large cake. 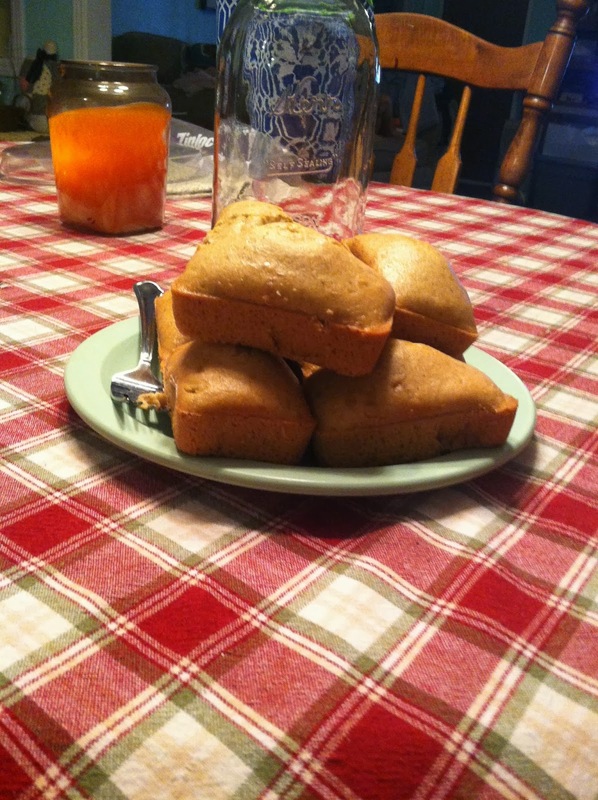 The cakes rose very well, and were not flat at all. 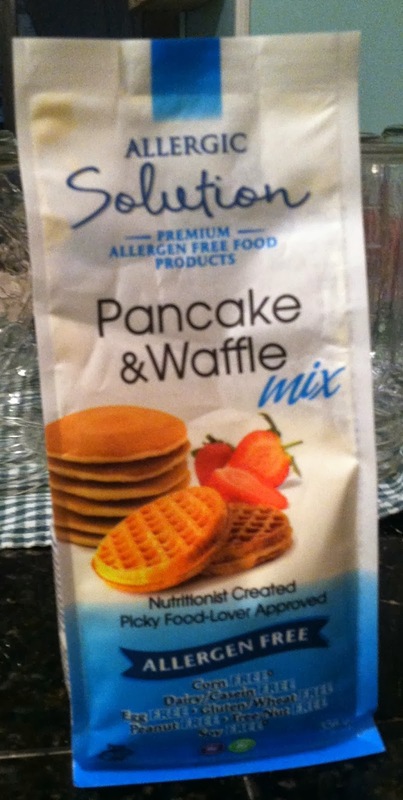 Overall, I think I will buy these mixes again, and I would defiantly recommend these to those with food allergies. So now are you wondering how to go about getting some of the mixes? Disclaimer: Allergic Solution sent me four (4) mixes for me to review, however, my words are my own, and I was in no way paid for my opinion. This post contains no affiliate links, and I stand to gain no profit from this blog. TruKid was started by Jennifer Adams Bunkers, a mother of 6, when decided that the chemicals found in most products just weren’t good for her children. 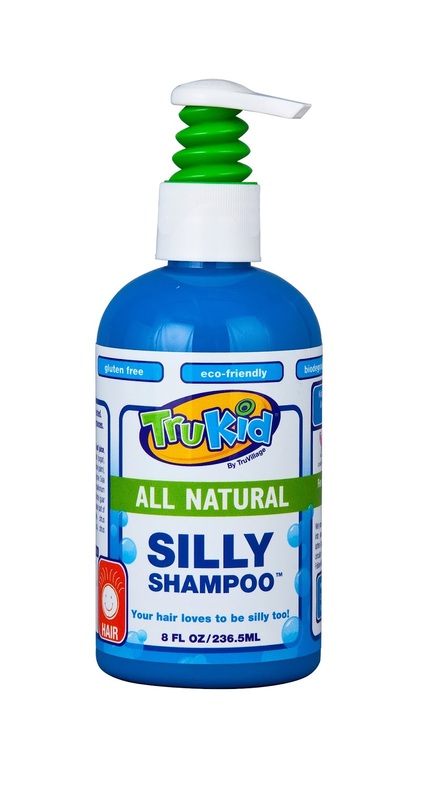 I love supporting moms with a vision of better products for our kids, so I was extremely excited when her company sent me a bottle of their Silly Shampoo. First of all, I have to say this shampoo smells awesome. I have never come across an all natural shampoo that smelled so good. It kinda reminds me of what kool-aid smelled like when I was a kid. Kind of berry like. It would make an awesome air freshener. It just amazes me that they have made the fragrance all with essential oils. Another problem I’ve had with other all natural shampoos is, it just doesn’t seem to get the hair clean. With some other products, my daughter’s hair looked dirty by mid day. 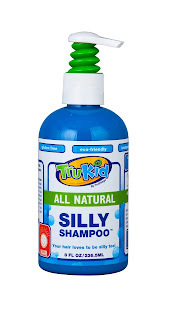 This is not true for TruKid Silly Shampoo. Goose’s hair looks awesome all day long. My last problem I’ve had with other all natural shampoos is price. With Goose, I keep going back to the same shampoo after trying others. It is so so expensive though. Actually, Santa brought some for Goose at Christmas, and I’ve been diluting it in a bottle so I can stretch it out some more since it is so expensive. TruKid products are affordable for pretty much anyone. At about $9 for 8oz, it is really and truly worth the cost. What is my take on this product? I love it! I am thinking about buying some for myself to use. Would I recommend this shampoo? YES!!!!! I think everyone needs a bottle of this shampoo in their home, kids or no kids. So. are you wondering how you get can your silly shampoo? Well, you can go to their website, http://www.trukid.com, or you can find their products on Amazon. Or you can order from TruKid.com and use copon code trumom and get 15% off orders $30 or more. You can also visit TruKid at the following links. There are two things that I am really really passionate about in life; children and animals. 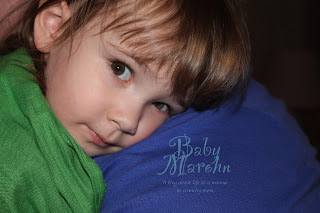 I know this blog is geared toward products and information regarding children normally, but I thought it was time to branch out once and do a review for a pet product. I worked as a veterinary assistant for several years, and in that time I used my fair share of nail trimmers on dogs. You know, when you when you do a job over and over, you find a favorite tool that you grab every time you need to do that job. For me, I had a favorite pair of orange handled nail trimmers that I loved. When I left the veterinary world, I wished I could take that one pair of nail trimmers with me. Since then, I have been looking for a pair of nail clippers that were similar, but I did not want to pay more than $10. Well, I have found them a pair of pet nail clippers that rival the orange handled ones. I was recently allowed to review Professional Pet Nail Clippers By Epica, and I love them. The pet nail clippers are precise and SHARP. Making great cuts every time. The nail clippers have a guard on them, so that you do not trim too much of the dog’s nail (I have removed that feature on other trimmers, but Epica really got it right). I found that the handle was very comfortable, and did not hurt my hand while I trimmed my dog’s nails. Another feature that I loved, was that the pet nail trimmers have a metal piece that locks them for safety when not in use. Other nail clippers I have used in the past, this part has been plastic. The dog nail trimmers are great, but I did have one tiny issue with them. When you squeeze the clippers to cut the nail, there is a pop sound, and the blades kind of catch on each other at the top. You can squeeze through it, and the clippers function wonderfully, but I would be a little concerned that it might wear the blades down quicker. I don’t know if it was just the pair I received or if this happens with every pair. All in all, this is a wonderful pair of nail trimmers for dogs. At $7.95 on Amazon, you can’t go wrong with these professional pet nail clippers. DISCLAIMER: I received one or more of the products mentioned above for free using Tomoson.com. Regardless, I only recommend products or services I use personally and believe will be good for my readers. These words are that of my own opinion. I started babywearing Goose a few months after she was born. I had no clue what I was doing, and ended up turning my cotton wrap into a cheap looking crotch dangler. I had no clue why it killed my back to wear her, since she was so small and I carried her all the time anyway. Turns out it was my poor wrapping skills at the time that was causing us both pain. Then one day, I was talking to another mom about wanting some more cloth diaper and other natural parenting stuff, and she told me about a local store that sells everything that was interested in, including babywearing products. On my first trip there, I left with a cloth diaper, an amber necklace, and a Boba baby carrier. 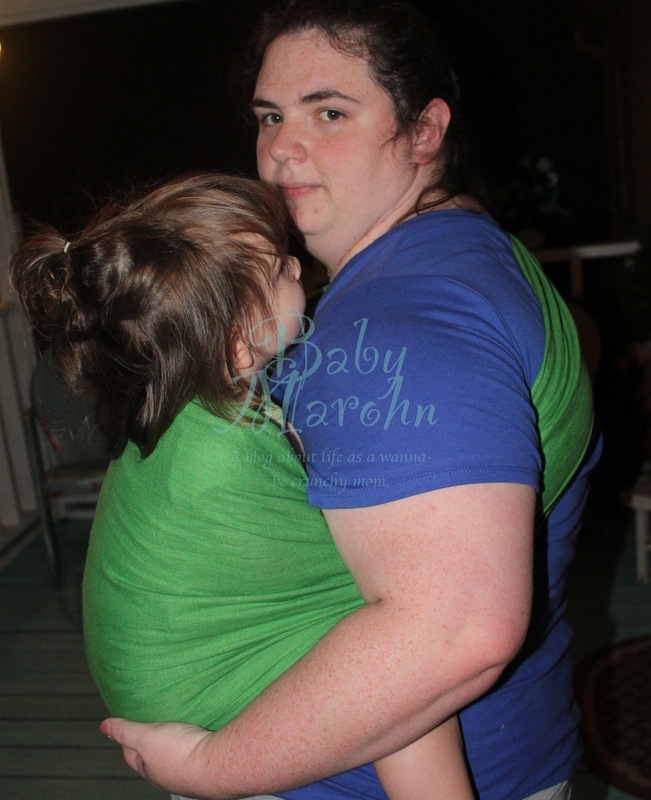 Thus beginning my obsession with babywearing. 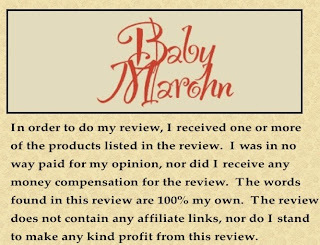 When Tiny Roos agreed to let me do a review, I was ecstatic! Of course I always get a little giddy when I get to do a review of a product, but this one has truly stood out, as far as ring slings (RS) go. In fact I love it more than I do my first RS. Tiny Roos sent me a beautiful linen RS in lime. Now, if you don’t know me personally, then you probably don’t know that I am a plus size woman. The RS that they sent me is a medium which measures 78″, and it fits me just fine. I was just not able to do a RUB carry, which is fine since I am not very good at it anyway. I love that the sling is linen. Why? Well, linen is super strong, breathable, and lightweight. Making it a wonderful product that is safe and enjoyable by both child and adult. It is also very simple to care for. They can be hand washed or machine washed on cold and gentle, and hung to dry. As far as I am concerned, Jessie, the owner, really did do a beautiful job on this sling. She makes sure they are super safe by using the best products out there. 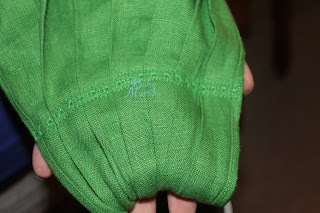 She was also able to add a little custom stitching for me near the rings, making this RS my own. So, are you wondering how you can get your Tiny Roos Ring Sling? Well, here are your options. BUY IT: Tiny Roos has an Etsy store that you can check out at http://www.etsy.com/shop/tinyroos, or you can check out their facebook page https://www.facebook.com/TinyRoosRingSlings. WIN IT: Tiny Roos has offered to giveaway one of their ring slings to one of my wonderfully awesome readers. Please enter on the form below for your chance to win. Please only one person per US household may enter who is at least 18 years old (or older). Disclaimer: I was provided a ring sling free of charge by Tiny Roos for this review. 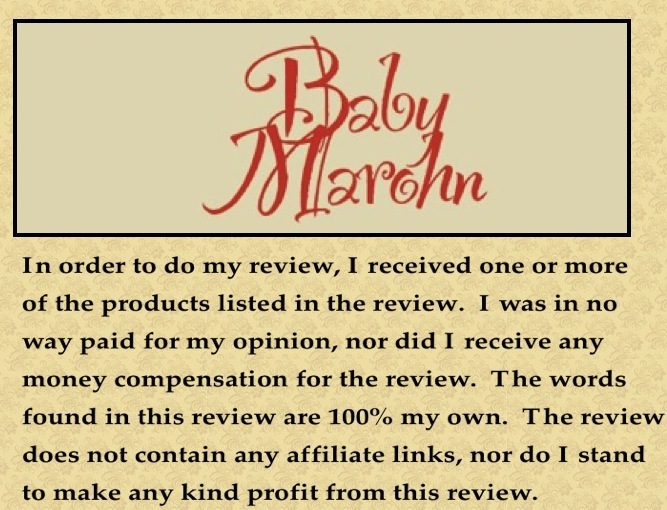 However, this review is based on that of my own opinion, and I received no monetary compensation for the review. **Photo credits go to my sister, Sarah Terry and SALT Photography. Thank you, Sarah, for your help and time. I have to tell you guys about a really neat lullaby cd that I recently came across. It’s by Jammy Jams and it’s call “Once Upon This Rock”. What it is are Christian rock songs that have been turned into instrumental lullabies. Here is a sample of one of the songs on the CD. Goose even loved this CD because she was able to hum/sing along to the music as we drove home. I think next I will put it on while we are in bed to see if it helps her sleep a little better, I’m sure it will because she fell asleep in the car. Jeff Bradford, owner, really had a brilliant idea when he came up with the Jammy Jam cd collection. As many of you know, I absolutely love to take pictures of Goose, and it has gotten to the point that I have no clue what to do with all the pictures that I have taken. I thought about printing them all off, making a photo album or scrapbook, and giving it to her so that she can look at it. But after checking prices, and looking through all the photos that I have, I believe that it may just be too expensive at the moment. So, when PearlMountain Technology contacted me about testing their CollageIt 3 software, I couldn’t refuse. CollageIt 3 is an easy to use app that can help you create beautiful collages. 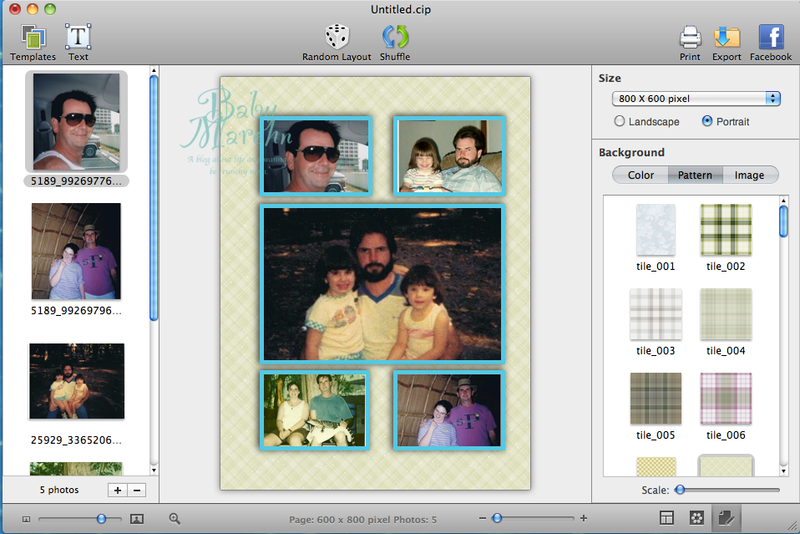 There are four different collage template styles that you can choose from: mosaic, center, pile, and grid. 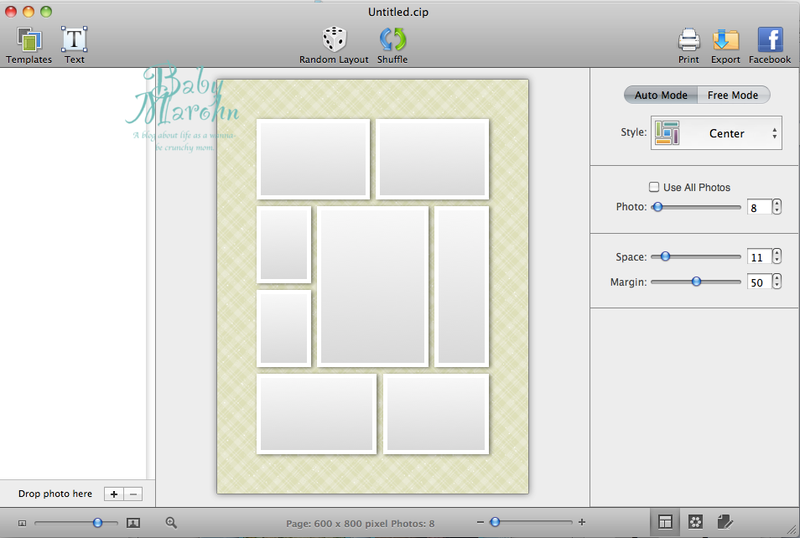 The templates are fully customizable, too. There are many ways to get the app. 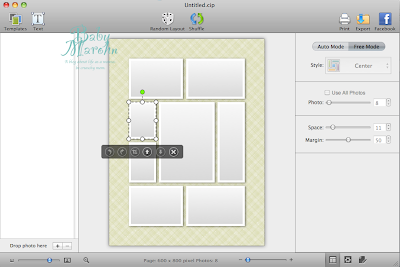 First, you can go to CollageIt’s website and download the free version. 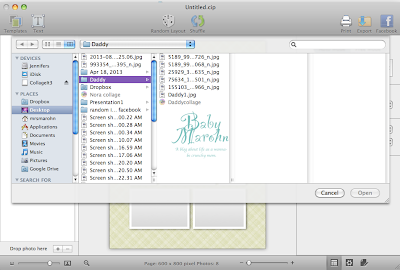 You can also download it from the App store if you are using a Mac. When you first open the program, a screen will come up and ask you what type of collage you would like to make. 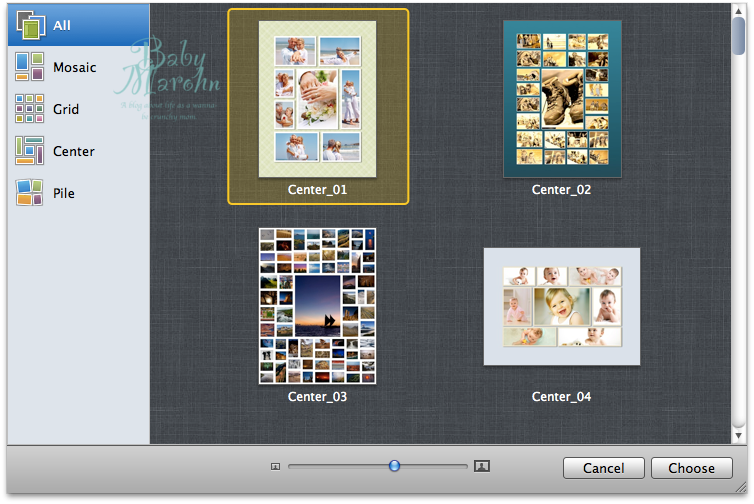 I chose the “center_01” collage, and pressed the “choose” button. I decided that I didn’t like the layout, so I pressed “random layout” to change it up. After going through a few, I decided to just go to “free mode”. 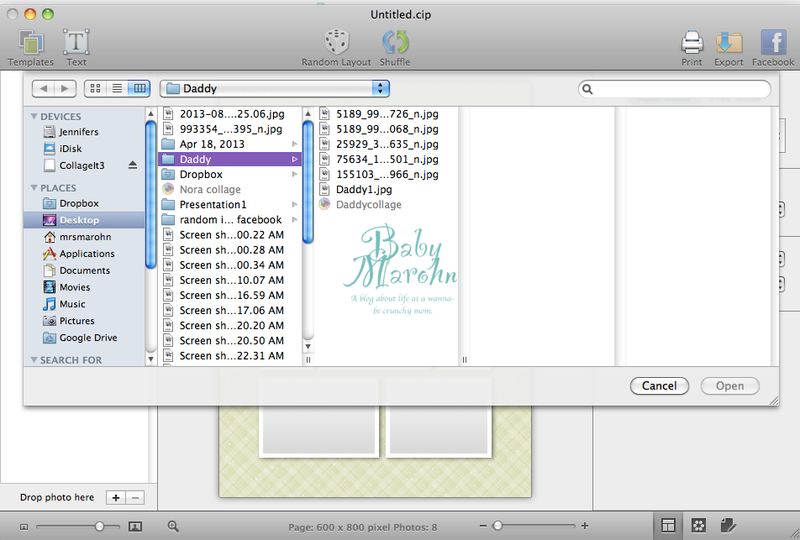 “Free Mode” allows one to arrange, delete, and add frames. Once I had all my frames laid out the way that I wanted, I clicked the “+” on the left hand side to add my photos. I decided that I wanted 5 photos of in the folder, so I clicked on the first photo, then pressed and held the shift key, and then clicked on the last photo I wanted. 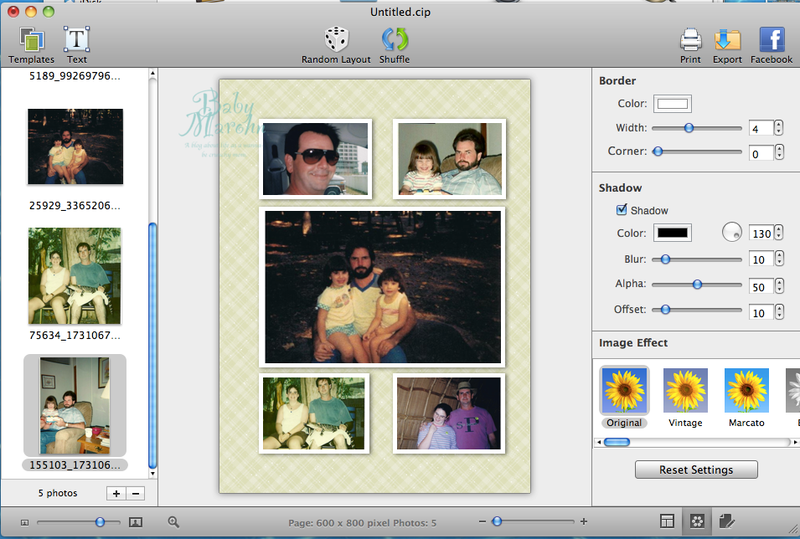 This highlighted all the photos I wanted, so when I pressed the “open” button I was able to add them all at the same time. CollageIt 3 automatically adds the photos in the frames for you, but if you can change them around. All you have to do is click and drag the photo you want from the left hand side into the frame that you want the photo to be in. If you look at the bottom of the screen on the right hand side, you will see three buttons. I wasn’t sure what they were at first, so I played around with them. The first one will allow you to choose the “free style” “auto mode”. 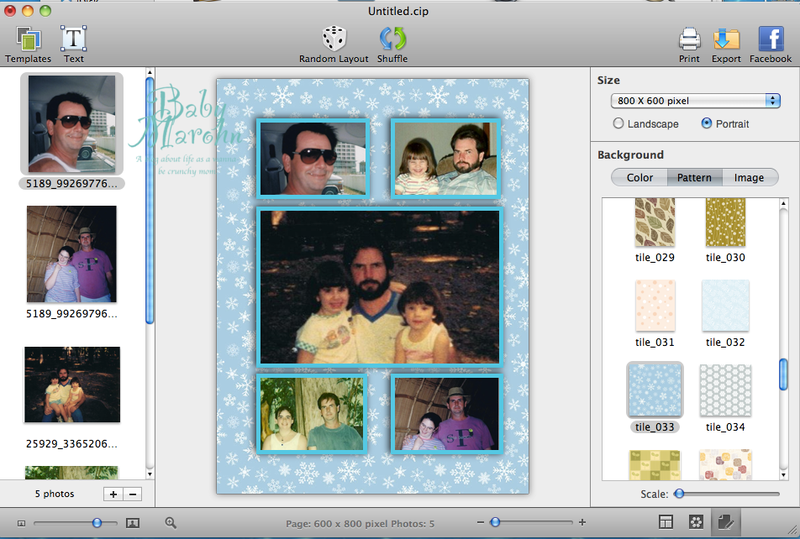 The middle one will let you change the border color, wights, and corner style. It will also allow you to change the shadow of the frames, and it has a simple image effects. The last one is all about background stuff. So after playing around with colors, shadows, and image effects, I decided on a color I wanted for the frames, but didn’t care for the background. So, I clicked the third button to change the background. 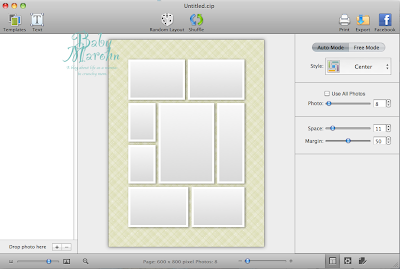 CollageIt 3 Pro comes with tons of backgrounds. I really had a hard time choosing. I went with a blue and white to match the blue frames. 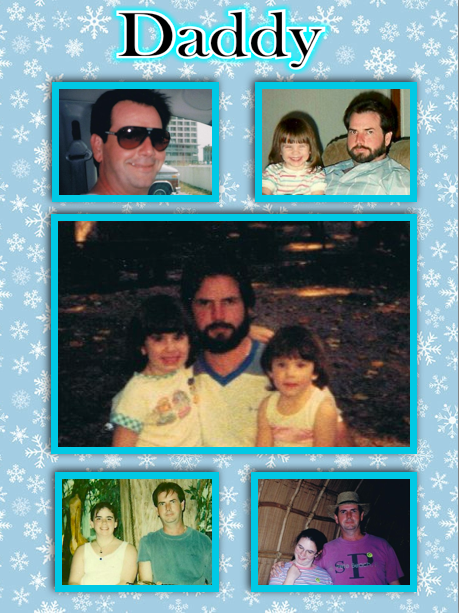 Every collage has to have text, so I clicked the box with the “T” in on it on the left hand side. 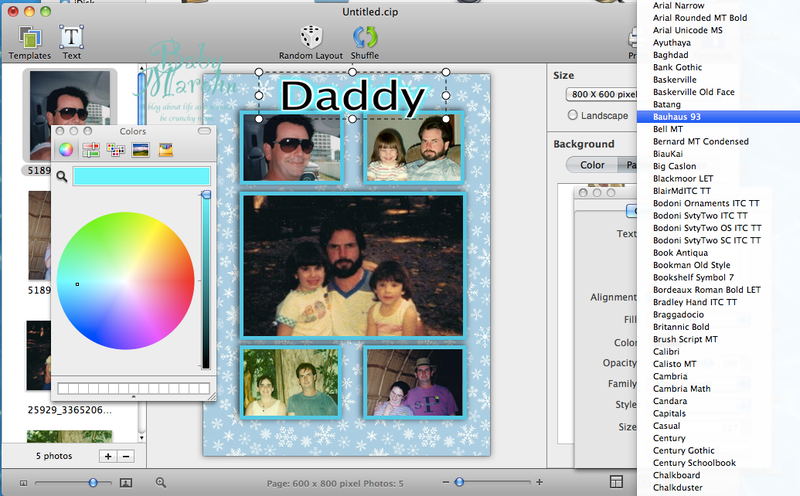 Once you add the text, you can then change color, font, add shadow and more. Everything is pretty much customizable in CollageIt 3 Pro. This is my end product. I think it turned out pretty well, and I am really looking forward to working on a few more, getting them printed, and making a book for Goose. I believe that it would be super simple for anyone to learn and use, and would be great for a busy parent like myself. Disclaimer: Even though PearMountain Technology provided me with a copy of CollageIt 3 Pro free of charge, the words in this post are that of my own.